Does your dog like to run away from home? Does your canine friend bolt out the front door every time he or she has the chance? Do you have a fence that your dog tries to dig underneath or climb? Have you had a quote for a professionally-installed containment system only to find out that it was way out of your budget? We at FlexPetz are here to offer you a better, cost-efficient solution. Our DIY containment systems work just as well as the pros and they are within an affordable price range. Visit our in depth Electric Dog Fence reviews section to find the perfect fence for your unique dog(s) and property. In order to select the right dog fence system for you, there are many factors that come into play. It is important to choose a system that is best for your dog, as well as one that will work with your yard. Our product descriptions contain in-depth information and real reviews that will help you make the right decision. Look for details such as how much area the fence will cover, what size of dog it is designed for and the number of correction levels that are offered. There are other aspects to consider when it comes to an electric dog fence. If you want your dog fence to be durable enough to stand the test of time, there are a few choices to make. For example, the Dog Fence Wire that comes standard in most DIY dog fence kits is 20-gauge. It is quite flimsy and will snap easily. Upgrading your wire to a thicker, 14-gauge wire is highly recommended. While the cheaper wire will function, it isn’t designed to hold up against the elements like a thicker dog fence wire will. If you were having a professional company install a dog fence for you, they would be using the thicker wire. All of our PRO-Grade dog fence kits include the upgraded wire. Something else to think about is lightning strikes. If your system gets struck by lightning, it can fry the transmitter. Some kits come with a low-grade surge protector to guard against power surges. However, the only way to be sure your fence is fully-protected from lightening is to choose a Heavy-Duty Surge Protector, which comes standard in our PRO-Grade dog fence kits. To ensure that you have a successful installation, it is important to create a good plan. Begin by making a quick sketch of your property, marking where you would and would not like your dog to have access. To help you out, visit our Planning Guide section for layout suggestions as well as pitfalls to avoid. Once you have planned your layout, it is time to choose how you wish to install the dog fence wire. You have the option of burying the wire with a machine, or by hand. It can also be attached to an existing physical barrier. You don’t even necessarily need to bury the wire. You can use garden staples to plant the wire on the surface of the ground. Installing an electric dog fence is relatively easy thing to do. 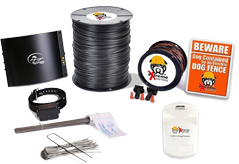 We provide you with everything you need to know about installing your electric dog fence in our Installation Guide. It outlines what to do step-by-step and also provides you with helpful tips and suggestions from professionals. In order for your dog fence to successfully contain your dog, you will need to properly train him or her on the fence. You can’t simply open up the door and expect them to figure it out. To begin, you will need a long leash and meat or moist dog treats. During the training process, which usually lasts about 2 weeks, you will be taking your dog out on the leash, getting him accustomed to where the fence borders are. About two training sessions that are 10-15 minutes long per day is a good start. During the first week, you will be showing your dog the boundary vs. the street, and your neighbor’s yard for example. You will spend time establishing the area your dog is allowed to stay in, and showing them where the border is. During the second phase of training, you will be creating distractions to ensure that your dog is able to handle himself in everyday situations. Common distractions include cars, children, bikers and joggers. For step-by-step instructions on how to train your dog on the fence, please visit our Dog Training section. We are also available to answer any questions you might have about training, installation, or selecting the perfect system for you and your dog by contacting us at 1-800-396-5517. Wondering how these systems measure up against the Invisible Fence® Brand? The quality of the systems we sell are just as good. The only difference is that we sell DIY dog fences and Invisible Fence® installs their system for you. Installing your own electric dog fence will save you big bucks and you will get the same great results. If you already have an Invisible Fence® installed on your property, we offer Invisible Fence® Compatible Batteries and Invisible Fence® Compatible Collars that cost a fraction of what you would pay if you bought them through Invisible Fence®. Do you have an Invisible Fence® and are tired of buying expensive parts and paying for expensive service calls? Why not just use the wire that you have, and get a new transmitter and collar from FlexPetz? We offer a cost-effective solution, sold without wire, known as our Invisible Fence® Replacement System. Whether you are starting from scratch or looking for products that work with your existing electric dog fence, at FlexPetz, we are eager to meet your needs!